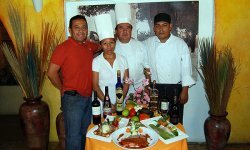 Cabo Chef Services in Los Cabos, Mexico! We have Mexican, French, English and Chefs from around the world. Elmar Villafuerte has decades of experiance in�Restaurant and Private Chef Services. Owner Tracy Dunlop has over a decade of experience and is far from Lazy. Expect nothing but the best from her and her crew. Pablo Velez has decades of experiance serving high quality cuisine in private villas and restaurants.